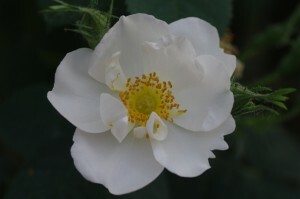 ‘Alba Maxima’ probably originated as a mutation of the rose ‘Alba Semi-Plena’ and has the same smooth gray-green leaves that is so characteristic of the Alba’s. ‘Alba Semi-Plena’ is one of the oldest roses in the Western world and can be traced through old paintings to the 14th century. Another sport of ‘Alba Semi-Plena’ is the rare ‘Rosa cannabifolia’ (Rosa alba cymbaefolia, À Feuilles the Chanvre). The latter has semi-double white or cream-colored flowers with long petals. It is a real rarity! The leaves have almost the same shape as Hemp, (Cannabis sativa). ‘Rosa cannabifolia’ is an Alba with a somewhat misshapen flower, but quite distinct hemp leaf. Recently a sport of ‘Alba Semi-Plena’ is discovered on a branch of ‘Rosa cannabifolia’ (by Hans van Hage of nursery De Bierkreek in the Netherlands). 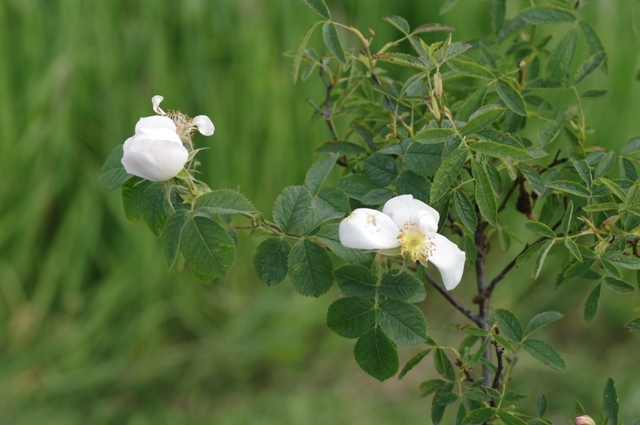 As ‘Rosa cannabifolia’ is a real oddity, we can asume by the malformations (the leaves do not resemble that of a rose), that ‘Rosa cannabifolia’ is the sport and ‘Alba Semi-Plena’ the original plant. (November 2012). ‘Alba Maxima’ is often found in old cottage gardens in England. 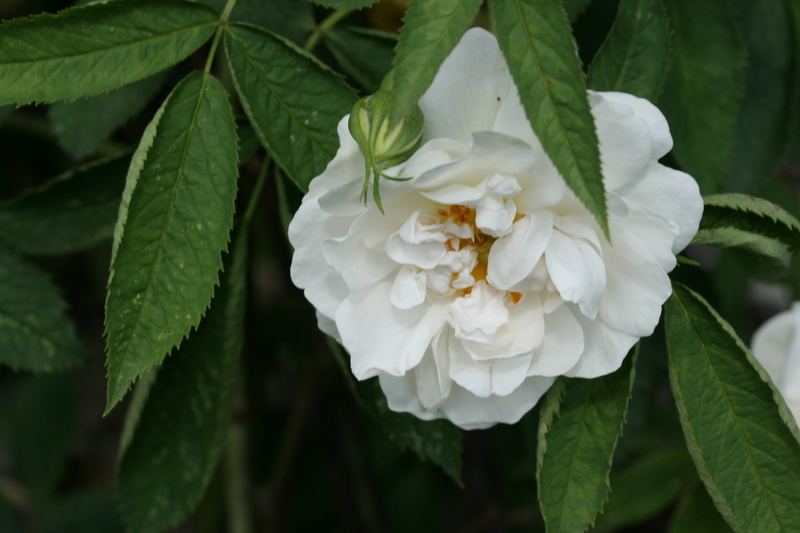 The double flowers are white with a hint of pink in the centre when first open and well scented. The branches bare few large, like most alba’s, straight thorns. This rose is sometimes prone to rust. 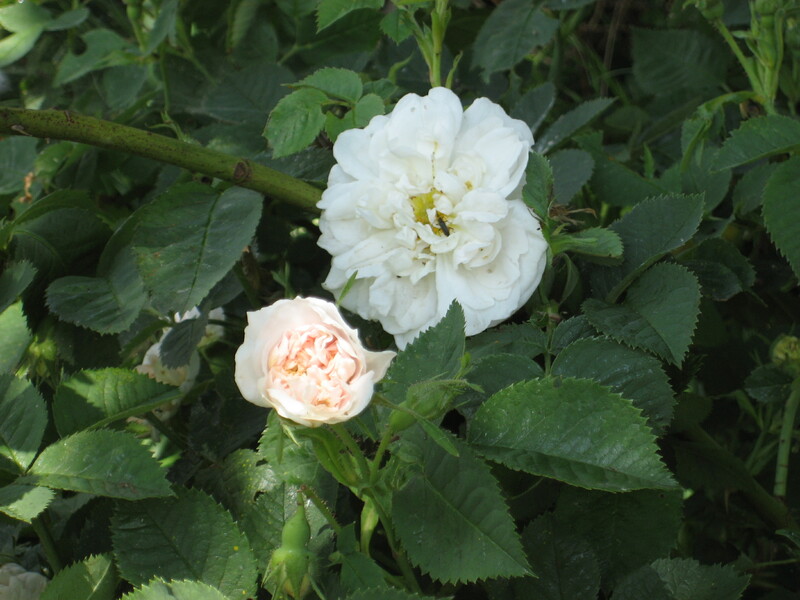 It is said that ‘Alba Maxima’ is the white rose next to the red Rosa gallica officinalis, both of which have played a role in the English rose wars. This is contradicted, because in old pictures it shows that both roses should have open flowers. 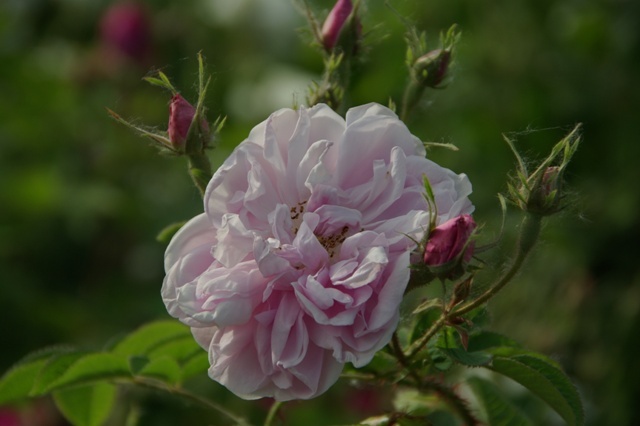 Rosa gallica officinalis is that more or less, but probably ‘Alba Semi-Plena’ is therefore the white rose of York and not ‘Alba Maxima’. ‘Alba Maxima’ has many other names, such as ‘Jacobite Rose’, ‘Bonnie Prince Charlie’s Rose’, ‘Cheshire rose’ and ‘Great Double White’. The name ‘Jacobite Rose’ refers to the exiled English king King James II , who as Duke of York had the white rose as his badge [symbolised] rebellion in Scotland against English rule. The Rose Wars is a description of the internal struggle that raged in England in the period 1455-1485. The struggle was between two aristocratic parties, who placed themselves respectively behind the house Lancaster (emblem of the red rose) and the House of York (the white rose emblem). The houses York and Lancaster both descended from Edward III Plantagenet. It is said that after the war a new pink rose symbolized the unity: this would be the Rose ‘York and Lancaster’, which in itself a rarity: a white rose which shows pinkish-red on random locations in the flower! Height of 6′ to 8′ (185 to 250 cm). Width of 4′ to 5′ (120 to 150 cm).